The highlight of the Russian Space Research Institute’s annual Space Science Day was the announcement of the latest results of RadioAstron—the first and largest Russian space mission in decades. Yuri Kovalev, who holds a Ph.D. in physics and mathematics and serves as head of the Astro Space Center Laboratory at the Lebedev Physical Institute, presented the results of the mission. 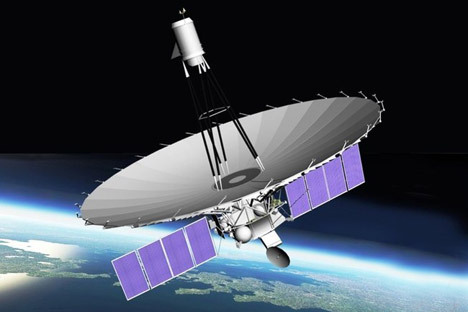 According to Kovalev, one of the past year’s milestones was the connection of the U.S. radio-telescope Green Bank to the radio interferometer as a second surface shoulder. “The Puschino and the American stations now cover 85 percent of the telescope’s orbit, and we’ve almost exhausted our capabilities,” said Kovalev. He noted, however, that the American observatory has been shut down, as the United States struggles to pass a budget. One of RadioAstron’s key missions has been measuring the surface brightness of active galaxies’ nuclei. In theory, the brightness of quasars should not exceed 1012K. Yet observations of certain active nuclei showed brightness in excess of this threshold — up to 1013K. According to Kovalev, there is no good explanation for this, though scientists are working on several theories. Another surprise brought by RadioAstron has to do with never-before-seen characteristics of interstellar space. Observations of pulsars — neutron stars with magnetic fields — helped in the discovery of these characteristics. According to Kovalev, by observing the echo from the Vela pulsar, scientists immediately noticed a strange, needle-like structure of the interference picture. “The echo from this pulsar came in the form of needles — individual spikes. Everyone just scratched their heads, as this goes counter to the accepted theory of the nature of interstellar space,” said the Astro Space Center Laboratory head. Researchers blame the phenomenon on special turbulent clots that act as lenses, which focus the images of pulsars while light from those remote objects travels toward Earth. The so-called early mission research program ended this summer, and the core scientific program has since begun. “There are no more than 400 radio astronomers in the world who conduct research in the area of radio interferometry with super-long bases. More than half of them are working with us. We are very pleased about that,” said Kovalev. Seven projects have been competitively selected to take part in the core research program, with Russian applicants leading half of those applications. Kirill Sokolovsky, a graduate of the astronomy division of Moscow State University’s Department of Physics, spoke in detail about the program he proposed (“Observation of Radio Transients”), which RadioAstron will be pursuing in the months ahead. “Radio transients are an umbrella concept: Anything that shines within a radio range could be called that. I am interested in observing objects such as classic novae, super novae, micro quasars and X-ray-emitting double stars, which can generate radiation under certain conditions. While those are all different objects, we can also gauge their brightness, temperature and understand the mechanisms behind their radiation,” Sokolovsky said. According to Sokolovsky, this program is different from all others in that it envisages aiming the telescope not at known objects but at newly flaring ones.